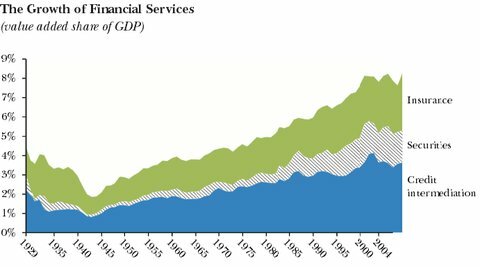 As an economist living in the Post-Great Recession world, I often consider the effects of greater financial sector regulation on overall economic performance. During a period of weak economic growth, which we are now just starting to emerge from, a growth sector such as finance should not be held back. Listening to (part) of the hearing between the Senate Subcommittee and Goldman Execs, who invoked the concepts of economic efficiency and job growth with bravado, this is exactly what financial sector advocates want people to think. If GDP growth doesn’t necessarily help people, perhaps a slight slowdown in growth would not necessarily hurt people? It has long been accepted by development economists that GDP growth alone is not a reliable measure of increases in well-being / standard of living. Is it time to consider that paring back GDP growth, in order to set our financial system on more sustainable ground, might be in best interests of the vast majority of Americans? Before considering these points, we should explore (1) how the financial sector got “too big to regulate”, and (2) why efforts to regulate big banks have proven so lackluster. A two-year Senate-led investigation is throwing back the curtain on the outsize and sometimes hidden sway that Wall Street banks have gained over the markets for essential commodities like oil, aluminum and coal. The Senate’s Permanent Subcommittee on Investigations found that Goldman Sachs and JPMorgan Chase assumed a role of such significance in the commodities markets that it became possible for the banks to influence the prices that consumers pay while also securing inside information about the markets that could be used by their own traders. Until about 20 years ago, regulated banks faced tight constraints that barred them from owning physical commodities and limited them to trading in financial contracts that were linked to the prices of commodities. But a substantial relaxation of the rules allowed the banks to own actual commodities themselves, known as “physical assets” on Wall Street. During the second panel of the day, two executives from the aluminum industry said that Goldman’s practices were unusual and were costing aluminum users. “The warehouse issue is having a profoundly negative impact on our customers’ businesses,” said Nick Madden, the chief supply chain officer at Novelis, a producer of rolled aluminum. Mr. Madden said that when he first saw The Times article on Goldman’s practices, he didn’t understand why the warehouse company was encouraging long lines for customers wanting to remove their metal. “Now I see it in black and white and I understand it,” he said, in reference to the subcommittee’s report. One warehousing source, who is familiar with these transactions, said what he read in the report was “immoral, but not illegal”. Far from increasing efficiency, it appears that financial intermediation may actually harm related “real” elements of the economy in certain situations. So deregulation has led to expansion by financial institutions into “physical assets”. But what about regulations that are still on the books? Surely, in the wake of The Great Recession, accountability and transparency have been force-fed down the financial sector’s throat? A senior Democratic senator (Jack Reed) has introduced legislation that would make the head of the New York Federal Reserve Bank a presidential appointee subject to Senate confirmation. The New York Fed also oversees some of the nation’s largest financial institutions, and has been questioned in recent years for failing to look with enough rigor at the operations of companies like JPMorgan. The hearing on Friday will address the question of whether Fed regulators may be too soft on the banks they oversee. The idea of making the job a presidential appointment is not a new one: with Reed’s support it was included in the Senate’s version of Wall Street reform legislation in 2010, although it was not included in the final Dodd-Frank law. “The perception today, and the perception for years, is there are no fences between the New York Fed and the banks they’re regulating,” said Reed. After the subcommittee finished questioning Dudley, it turned to the matter of solutions. Columbia University professor David Beim, the author of a harsh internal investigation into the New York Federal Reserve, told the subcommittee that more needs to be done to eliminate the revolving door between the finance industry and the Fed. “The problem is regulators and bankers form a community,” he said. Given the dysfunction of our Federal government, making the NY Fed President a presidential appointee subject to congressional approval is by no means a sure fix. But there have been bipartisan efforts to reign in the financial sector; such a move could certainly be part of a more comprehensive financial sector reform agenda. ..Six years after the onset of the financial crisis, four years after Dodd Frank and two years after the biggest banks submitted the first drafts of their living wills — the Federal Deposit Insurance Corporation and the Federal Reserve rejected the plans from 11 large banks as “unrealistic or inadequately supported.” The regulators said further that the banks had failed “to make, or even identify” structural and operational changes that would be needed to attempt an orderly resolution. And yet the regulators are not taking steps to downsize the banks. For that to occur, the F.D.I.C. and the Fed have to agree that living wills are unworkable and that more forcible downsizing is needed. The F.D.I.C. seems to have reached that conclusion; it said flatly that the plans don’t work. But not the Fed, which has told the banks to submit new plans by July 1, 2015. The banks have had four years already. Now they have nearly another year to toy with a process that has utterly failed to produce credible results. Will anything change between now and next July? Using the history of the last several years as a guide, the biggest banks will be even bigger, more complex and more interrelated by then. They will be undercapitalized and overleveraged. They will be reliant on unstable sources of short-term financing and will be more steeped than ever in speculative derivatives transactions. In short, they will still be too big to fail, too big to manage and, judging from the Fed’s latest indulgence, too big to regulate. While business cycles are largely natural occurrences, the severity of downturns are largely determined by the regulatory policies in place. This is why, following the Great Depression, rules limiting questionable financial activities were put in place. But as time went on, and the pain of The Great Depression faded in memory, these rules were repealed in the name of economic efficiency / growth. Instead what we got was increasing inequality and the regulatory groundwork which enabled The Great Recession. We must stop relying on “self-regulation” of the financial sector; the fact that the Fed has given financial institutions so much leeway and time in writing their own “living wills” is indeed disconcerting. Since the collapse and bailout of the financial sector, “Too-Big-To-Fail” financial institutions have only gotten larger, potentially setting the stage for an even more painful recession down the road. When growth is the result of over-leveraging, opaque bundling, insider trading, and imaginative accounting, it benefits a select few at the expense of everyone else. It is past time to question the assertion that tighter regulation of financial markets will lead to a meaningful increase in unemployment / deterioration of standard of living. All evidence points to the contrary; financial regulation would benefit the vast majority, at the expense of a select few who have made their fortunes exploiting loopholes and shady relationships. The further we get from the financial crisis, the less necessary tighter financial regulation will seem. The “benefits” of having an under-regulated financial market will look that much greater than the “costs” of regulation–until it all comes crashing down. The time for meaningful action is passing us by. Categories: Blog Posts, Economic Outlook | Tags: commoditization, financial crisis, financial sector, financialization, Goldman Sachs, Great Depression, Great Recession, inequality, physical assets, regulation, securitization | Permalink. Errata:: Senator Reed is the senior senator from RI.